Rotationplasty is a functional surgical procedure for children undergoing resection of a malignant bone tumor around the knee joint. The affected bone is resected and the tibia is rotated 180 degrees to form a functional knee joint. Originally described for the treatment of infections and congenital limb deformities, it is now used primarily as a reconstructive option for children of growing age diagnosed with a malignant bone tumor around knee joint. 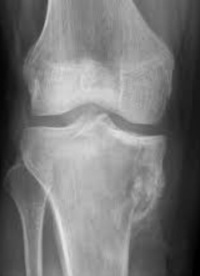 Rotationplasty involves removing the area of bone affected by the tumor along with some amount of normal bone to ensure there is a “CLEAR MARGIN”. In this Procedure a portion of femur and tibia is excised and the lower leg is rotated to 1800 and reattached to the proximal femur with screws and plates to hold them in reduced position until healing occurs. This gives the appearance of a short leg with the foot on backwards. Foot & ankle then function as knee joint, allowing the patient to wear more functional & customized below knee prosthesis. resected distal femoral and proximal tibial epiphysis. 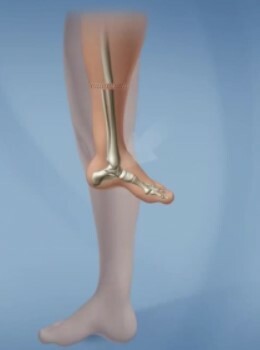 Therefore, minimal over length of the ankle of the operated leg is retained. Surgical procedure itself takes 6-10hours to complete. Following the surgery, the child is usually admitted to the intensive care unit for 24-48 hours to ensure close monitoring of blood supply to the foot. The length of hospitalization is usually anywhere from 5-7 days. Child is usually placed in to cast, which remains for 6-12 weeks or potentially longer, depending on bone healing. Once the bone & surgical incision healed adequately, the child can be fitted for prosthesis. Functional Joint at the level of the knee, which allows for a smaller & better functioning prosthesis. Allows child to perform better in sports & ADL’S. To restore complete function after the rotationplasty procedure, a properly designed & fitted prosthesis is a must. Measurement – it requires exact measurements for height, weight and knee alignment. Equally important for function. Casting-the prosthetist captures the model of the residual limb by creating a mould through casting. It serves as a blue print for the building of a housing for the residual limb foot. Prosthetic creation- prosthetist creates the prosthesis. Attachment- prosthetic foot, ankle, support bars and Velcro straps are attached to the housing. Finished product- patient works with the prosthetist to determine fit, comfort, & function. Communication between the patient prosthetist are key to a successful prosthesis. To Regain muscle strength & function. Stretching and strengthening exercises will be taught immediately after Rotationplasty to the patient and family to gain active and passive Range of Motion followed by strength training. Depending on the procedure, involvement of surrounding structures and condition of the child, child may not be allowed to bear weight on the leg. The orthopedic surgeon will determine when to bear weight & standing on leg is safe. Typically weight bearing is limited to toe touch for moving from chair to bed, toilet and wheel chair. 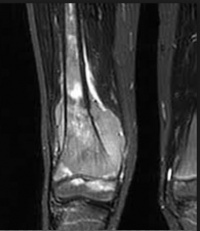 It may take longer for the bone to heal to bear weight due to the effects of chemo therapy on the process of healing. Initially stretching exercises for hip, ankle, foot and toes are instructed to the child and family. Crutches and wheel chair are used for mobility and transportation. Therapist will teach the patient and family members to wrap the limb with a compressive stockings to minimize the swelling. As soon as bone healing is completed the surgeon will prescribe prosthetic fitting. Physical therapist & prosthetist will work together to progress child from standing to walking in parallel bars to walking with a walker or crutches followed by walking without crutches. Stretching and strengthening exercises are continued in and out of prosthesis. The muscles of the calf, ankle, toes all play a role in controlling the prosthetic knee which is the child foot while in the prosthesis. The importance of stretching & strengthening the muscles in and out of the prosthesis cannot be stressed enough. Once it is decided to have Rotationplasty, speaking to the child about all that is happening can be heard and complicated for the family members. Losing an extremity often involves grieving a loss. Not only the child physically losing limb, but he or she may be losing how they identify themselves. Allow the child to feel sad, angry and shocked. All of these responses are normal for a given their current situation. The child may have a lot of questions before his or her rotationplasty. It is important for the parents to keep communication simple and honest. Most of the children need a greater understanding of words and phrasing used by yourself and medical team. To Accomplish this define words using simple, concrete language. Nothing can stop a 15 year old Gabi Shull from dancing “NOT EVEN CANCER”. When she was 9 years old, diagnosed with OSTEOSARCOMA in her knee, which resulted in amputation to the affected area. Shull who was an avid dancer, was concerned she might never be able dance in a studio until she went ROTATIONPLASTY. In this video Shull explains how the surgery has helped her in continuing her passion for dance. ↑ 1.0 1.1 1.2 Rota V, Benedetti MG, Okita Y, Manfrini M, Tesio L. Knee rotationplasty: motion of the body centre of mass during walking. International journal of rehabilitation research. Internationale Zeitschrift fur Rehabilitationsforschung. Revue internationale de recherches de readaptation. 2016 Dec;39(4):346. ↑ 3.0 3.1 3.2 3.3 3.4 Sakkers R, van Wijk I. Amputation and rotationplasty in children with limb deficiencies: current concepts. Journal of children's orthopaedics. 2016 Dec 1;10(6):619-26.